Established in 1985, Strawberry Fields operates from fully equipped kitchens staffed by a team of full-time experienced chefs. A fleet of refrigerated vehicles enables them to supply food hygienically and in first class conditions to the most remote sites - even those without a power source. Strawberry Fields has earned an enviable reputation which has been built on an unfailing dedication to excellence, a pride in the quality of presentation, a high standard of personal service and reliability and, above all... Superb Food. When planning a wedding, you will want everything to be perfect. At Strawberry Fields, we know that attention to detail is critical to ensuring that the wedding reception runs smoothly. We have a team of dedicated Front of House Managers to help with the planning of your perfect day. Our choices of menus are also vast and dishes can be made to your individual requirements. At a dinner party, the focus is on the style and quality of the food, the way it is served and the ingenuity of the menu. We can prepare all food on our premises, delivering far and wide in our fleet of refrigerated vehicles. Alternatively, we can use your facilities to prepare and serve the menu of your choice, professionally and discreetly, so that you can focus on entertaining your guests. Strawberry Fields offer catering and event management at a number of venues throughout the South West and South Wales. Our team of event managers are on hand to assist with the planning of your event including on the day management. For more information of the venues we work at please visit our Venue Page. 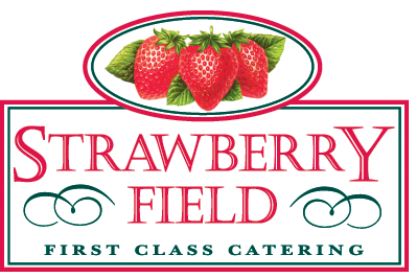 Strawberry Fields is becoming widely known as a reliable provider of top quality cuisine and service for the corporate market and has considerable experience with all aspects of corporate catering.